Holy Baptism holds the first place among the sacraments, because it is the door of the spiritual life; for by it we are made members of Christ and incorporated with the Church. And since through the first man death entered into all, unless we be born again of water and the Holy Ghost, we can not enter into the kingdom of Heaven, as Truth Himself has told us. The matter of this sacrament is true and natural water; and it is indifferent whether it be cold or hot. 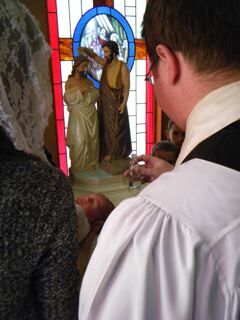 The form is: I baptize thee in the name of the Father and of the Son and of the Holy Ghost. We do not, however, deny that the words: Let this servant of Christ be baptized in the name of the Father and of the Son and of the Holy Ghost; or: This person is baptized by my hands in the name of the Father and of the Son and of the Holy Ghost, constitute true baptism; because since the principal cause from which baptism has its efficacy is the Holy Trinity, and the instrumental cause is the minister who confers the sacrament exteriorly, then if the act exercised by the minister be expressed, together with the invocation of the Holy Trinity, the sacrament is perfected. The minister of this sacrament is the priest, to whom it belongs to baptize, by reason of his office, In case of necessity, however, not only a priest or deacon, but even a layman or woman, nay, even a pagan or heretic can baptize, provided he observes the form used by the Church, and intends to perform what the Church performs. The effect of this sacrament is the remission of all sin, original and actual; likewise of all punishment which is due for sin. As a consequence, no satisfaction for past sins is enjoined upon those who are baptized; and if they die before they commit any sin, they attain immediately to the kingdom of heaven and the vision of God. Please contact Father Patrick McBride if you have questions regarding Baptism or to schedule a Baptism.